In November I wrote about the pension file of Jacob Bahle, my third great grandfather and a Civil War veteran of the 6th Pennsylvania Heavy Artillery. 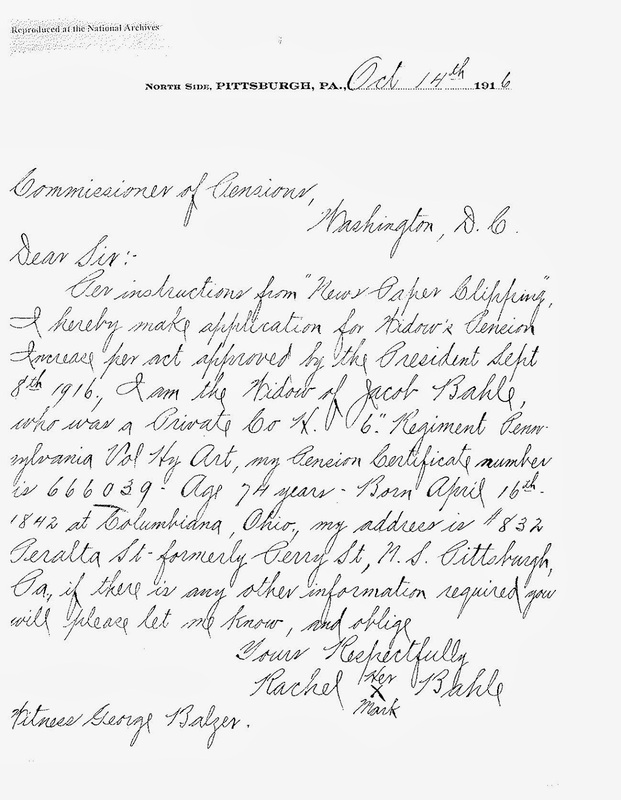 This letter was among several in the paperwork what his wife Rachel filed with the Pension Bureau after Jacob’s death in 1908. As other documents in the pension file indicate that Rachel could not write, and her mark “X” is written between her first and last names, I believe this letter may have been written by the witness, George Balzer. Per instructions from “News Paper Clipping”, I hereby make application for Widow’s Pension Increase per act approved by the President Sept 8th 1916. I am the Widow of Jacob Bahle, who was a Private, Co. H. 6″ Regiment Pennsylvania Vol Hy Art, my Pension Certificate number is 666039. Age 74 years. Born April 16th 1842 at Columbiana, Ohio. my address is #832 Peralta St. – formerly Perry St., N.S. Pittsburgh, Pa, if there is any other information required you will please let me know, and oblige. Letter from Rachel Bahle to Commissioner of Pensions. Part of Soldier’s Certificate No. 931,333, Application No. 1,137,044, Jacob L. Bahle, Private, Company H, 6th Pennsylvania Heavy Artillery; Case Files of Approved Pension Applications of Veterans Who Served in the Army and Navy Mainly in the Civil War and the War with Spain (“Civil War and Later Survivors’ Certificates”), 1861–1934; Civil War and Later Pension Files; Records of the Department of Veterans Affairs, Record Group 15; National Archives Building, Washington, DC.